Rolls-Royce, Daimler and Vanden Plas limousines have been the primary choice of Royalty and civic dignitaries worldwide from the early 1900s to the present day. These most prestigious of marques have always been associated with the highest standards of passenger comfort, coach building and engineering performance. At Aristocars, we believe that nothing less than the best is suitable for a bride’s special day. 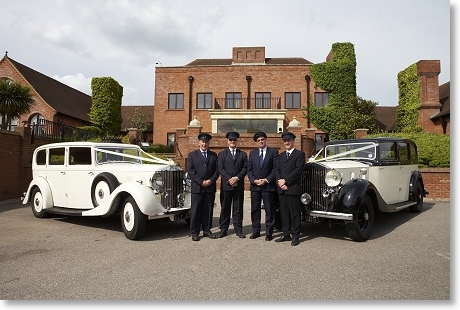 To that end, we have now built up one of the largest collections of Rolls-Royce and Daimler limousines available for wedding hire in the South of England. It is no accident that Aristocars is recommended by more local wedding venues than any other local company. Our close association with many of the local venues has been developed over the last 20 years during which time the quality of our service has continued to outperform other smaller companies that have continually fallen by the wayside. Some companies will attempt to carry out 2 or 3 weddings in one day with the same car. We guarantee that each of our cars carries out only one wedding per day, therefore you will not be rushed by our drivers and because your car has not been delayed at another wedding, you can be assured it will arrive on time. We personally own and operate all the cars detailed on this web site making us one of the largest vintage wedding car suppliers in the area. We always have back-up transport available. Book early to avoid disappointment! We start to take bookings approximately 2 years in advance of the wedding date. The earlier you book, the greater selection of cars you will have to choose from. All our cars can be viewed undercover, at one location in our own lit premises and at any time, but by appointment only please. Some car companies offer two door cars with fold-over front seats; these are totally unsuitable for bridal use. Not only do they have insufficient room in the rear, but the access in and out of the vehicle is extremely ungainly! All our cars have four doors, with the limousines offering the widest doors for easy access in and out of the spacious passenger compartment. The quality of the interior of the car is extremely important for both comfort and appearance - most of our cars have been recently re-trimmed with the finest quality leather hides. Many are trimmed in lighter colours to provide an open, airy and light interior, most important for those photos of the bride and groom inside the car. Many of our limousines have extra drop down seats in the rear compartment for bridesmaids, etc. This enables you to use perhaps the same car for the bridesmaids party to the church and then for the bride and father, but please remember, if the journey to the church is approximately 15 minutes, then the bridesmaids will have to be at the church for nearly 40 minutes prior to the bride arriving. In this instance therefore, we would normally recommend the use of a second car. Please consider also that whilst 2 trips to the church in one car may be entirely feasible, it is almost always the case that the one car can only perform one trip from the church to the reception venue with the bride and groom. This leaves the bridesmaids' party obtaining lifts with other guests, which may not always be either practical or desirable. We operate more Daimler DS 420s as second cars than any other wedding car company in the area, as we regard these cars as essential back-up service to our main vintage cars. All our cars carry umbrellas for that unexpected shower; all the drivers are uniformed with hats and suits and carry mobile phones. Prices stated are between Southend and Upminster, and Grays and Chelmsford. We may charge extra for exceptionally long journeys or locations outside the above areas. Much of our work now comes through recommendations. We would be happy to show you some of our letters of recommendation when you come to view the cars. We invite you to view our cars at your convenience for an informal discussion regarding your requirements.